Brian Vickers has made the best of his part-time ride with Michael Waltrip Racing this season. The question now is, will it pay off? The former NASCAR Nationwide Series champion was left high and dry when Red Bull Racing cashed in its NASCAR chips at the end of the 2011 season. 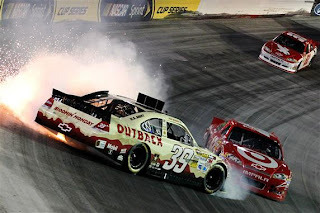 A tempestuous campaign that included numerous wrecked race cars and on-track confrontations with Matt Kenseth and Tony Stewart arguably lowered his stock in the NASCAR garage, and the best offer he received for 2012 was a limited, six-race slate at the wheel of MWR’s No. 55 Toyota. Vickers has taken that meager ball and run admirably with it, recording Top-5 finishes in three of his six starts this season, en route to an average finish of 14.3. That statistic would be even better if not for a blown engine suffered during pace laps at Watkins Glen that relegated him to a disappointing, 43rd-place showing. There is no doubt Vickers has made the most of his limited opportunities this year. 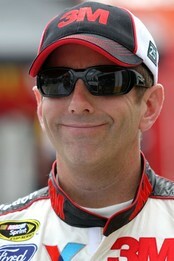 And yet, he is likely to take the green flag only twice more in 2012, with Mark Martin wheeling the No. 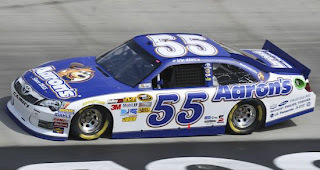 55 Toyota in nine of the season’s final 12 races and Waltrip =slated for duty at Talladega Superspeedway on October 7. Thus, despite a thoroughly impressive 2012 effort, it looks like another winter filled with uncertainty for a driver who has faced more than enough uncertainty in recent years. His 2010 season came to an early end after he was diagnosed with potentially life-threatening blood clots in his leg and lungs. Surgery later that year to repair a congenital heart defect cast his career in further doubt, and while he returned to the sport after completing an arduous course of blood-thinning medications in January of 2011, only to be left without a full-time ride when Red Bull bailed out at season’s end. At age 28, Vickers is hardly in the twilight of his career. But after recording just two victories in 117 career Sprint Cup starts for Hendrick Motorsports and Red Bull Racing, the North Carolina native is in danger of being surpassed by drivers just over half his age. Quality seats are difficult to come by in this day and age, and while MWR would like nothing better than to secure additional sponsorship, add a fourth car and run Vickers full-time in 2012, the team has -- so far -- proven unable to do so. Similar scenarios apply at Joe Gibbs, Richard Childress and Roush Fenway Racing; all of whom could expand to four cars next season, but only after signing significant new sponsorship. The open seat in Penske’s Racing’s No. 22 Shell Pennzoil entry will likely be filled by either Sam Hornish, Jr., or Joey Logano next season, leaving Vickers to compete for possible openings with the usual roster of mid-pack teams. Sources say BK Racing has expressed preliminary interest in Vickers, and Phoenix Racing could be interested, if team owner James Finch is able to keep the doors open and driver Kurt Busch goes elsewhere in 2013. Most likely, however, is a return to Michael Waltrip Racing for another severely limited slate of events. With his health and competitive edge intact once again, Vickers clearly deserves better. Michael Waltrip Racing has announced multiyear contract extensions with Martin Truex Jr. and NAPA Auto Parts that will keep Truex behind the wheel of the #56 NAPA Auto Parts Toyota in the NASCAR Sprint Cup Series. NAPA will continue as one of the few full-time primary sponsors in the series, sponsoring all 36 NASCAR Sprint Cup points races and the sport's two non-points events each season. "NAPA and I have been together a long time and they are family to me," said Michael Waltrip, who founded MWR and co-owns the three-car team with Rob Kauffman. "They have been to Victory Lane with me, helped me launch my own race team and have been our team's biggest supporter through the years. It is hard to describe how grateful I am that NAPA feels good enough about our organization to continue this partnership." Waltrip said re-signing Truex, who began racing for MWR in 2010, has been a priority. "Re-signing Martin was huge for us. We've given him competitive race cars and engines this year and he's been able to showcase his talent. Where I am most proud of Martin is off the track. He has dedicated himself to be a leader in our organization and has accepted his role as an ambassador for our sponsors. His work with NAPA, Toyota, AAA, along with his foundation work, has shown his maturity as a person and he makes me proud." MWR, Truex and NAPA have enjoyed unprecedented success in 2012. Currently fifth in Sprint Cup driver points and battling for a spot in the Chase for the Sprint Cup Championship, Truex owns five Top-5 and 13 Top-10 finishes this season; all career bests. "Driving the NAPA Auto Parts Toyota means the world to me," said the 32-year-old Mayetta, N.J. native. "I knew when I signed on for the 2010 season that we had a lot of work to do to get the performance to where NAPA would be proud of us, and I also knew I had big shoes to fill in that NAPA uniform because Michael is the best at being an ambassador for sponsors. It is so gratifying that the hard work has paid off with competitive race cars every week. And I am more comfortable than ever that NAPA is my sponsor and I am their driver. It's my job to do everything I can to make sure we are together for the rest of my career." The company said its affinity for NASCAR has never been stronger. "We put a lot of time in evaluating where we choose to spend our marketing dollars and decided NASCAR continues to be a good fit for us. The sport garners tremendous fan support whose loyalty to NASCAR sponsors is unsurpassed and for that we are most appreciative," said Paul Donahue, President of Genuine Parts Company. "Once we decided on NASCAR, we determined that MWR was the team we wanted to continue to support. No other team has shown the improvement that MWR has over the past few seasons. We have been very pleased with the performance of Martin Truex, Jr. and the entire No. 56 NAPA team. Martin as well as all the folks at Michael Waltrip Racing continue to represent NAPA in a positive manner and we look forward to a successful partnership both on and off the track." 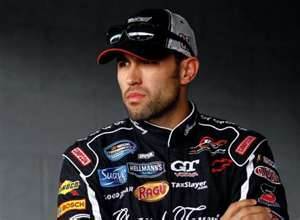 NASCAR Sprint Cup Series driver Aric Almirola will drive the No. 5 Jordan Truck Sales - Courtesy Ford 150 fielded by Wauters Motorsports in Friday night’s Jeff Foxworthy's Grit Chips 200 NASCAR Camping World Truck Series race at Atlanta Motor Speedway. Almirola replaces Paulie Harraka at the wheel of the No. 5 Ford, after Harraka struggled to a 22nd-place showing in championship points. 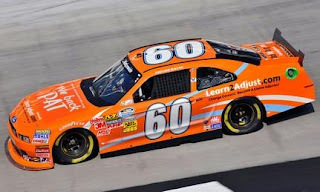 He did not compete in the series’ last two events, after being replaced by Scott Riggs and Johnny Chapman in a pair of start-and-park efforts at Michigan and Bristol. He is not expected to return to the Wauters Motorsports entry. Almirola has two NASCAR Camping World Truck Series wins with team owner Richie Wauters as the crew chief, winning at both Dover and Michigan in 2010. He has also made three previous starts at Atlanta's tricky, high-speed quad-oval in the Truck Series, with a best finish of third in that same 2010 season. 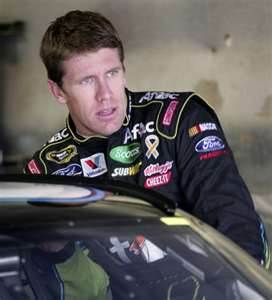 Wauters has had tremendous success as a crew chief at the 1.54-mile Atlanta Motor Speedway, with four wins, five Top-5, and seven Top-10 finishes in 12 start. Rimrock Design and Quick Lane Tire and Auto Center will also support the No. 5 Ford as associate sponsors at Atlanta. The Jeff Foxworthy's Grit Chips 200 at Atlanta Motor Speedway is slated for Friday August 31stat 8:00 pm ET. The national television broadcast on SPEED starts at 7:30pm ET. The event will be broadcast via radio worldwide on Motor Racing Network (MRN) and Sirius XM Satellite Radio. This week’s Goodyear tire test at the newly repaved Kansas Speedway is now complete, with a Goodyear spokesman saying the company now has the information it needs to finalize a tire compound for the track’s NASCAR race weekend in October. Nine NASCAR Sprint Cup Series teams participated in the test on Tuesday and Wednesday; the No. 2 Penske Racing Dodge with driver Brad Keselowski, the No. 9 Richard Petty Motorsports Ford with Marcos Ambrose, the No. 17 Roush-Fenway Racing Ford with Matt Kenseth, the No. 20 Joe Gibbs Racing Toyota driven by Joey Logano, the No. 27 Richard Childress Racing Chevy with Paul Menard, The No. 42 Chip Ganassi Racing Chevy with Juan Pablo Montoya, Michael Waltrip Racing’s No. 55 Toyota with Mark Martin, the No. 78 Furniture Row Racing Chevy with Regan Smith and the No. 88 Hendrick Motorsports Chevy with Dale Earnhardt Jr.
Earnhardt was uninjured in a crash early in Wednesday’s final session, but was forced to withdraw. Greg Stucker, Goodyear's Director of Race Tires, expressed happiness with the test, saying, "After two days of testing at Kansas, we saw what was expected of a newly repaved track -- smooth, black asphalt and a considerable amount of grip. It took about a half-day of running with the nine cars involved in the test, but the track took rubber nicely and a narrow groove developed. We expect that groove to widen out during the race weekend. “The recently-raced Michigan tire package was our 'control' for the test, with several other options in that compound range evaluated. That proved to be the correct choice based upon tire temperatures, wear and driver comments, and I'd say it is currently the leading candidate for our Kansas race tire." 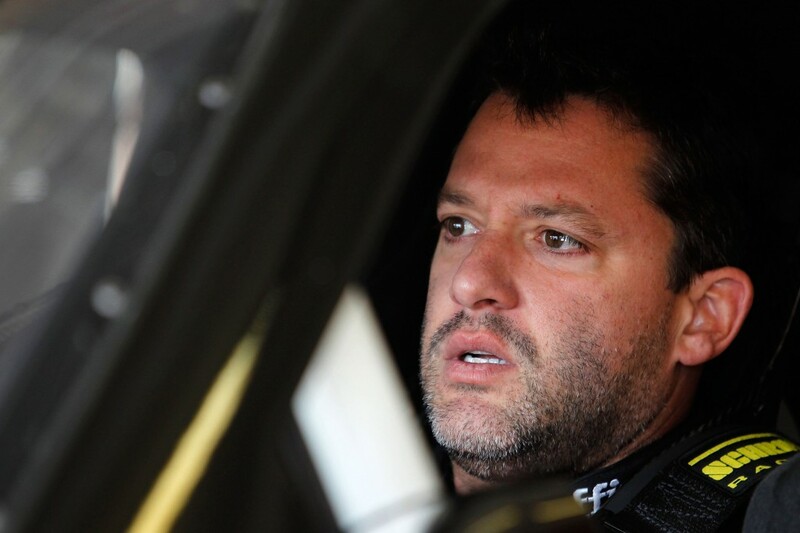 It’s been a rough couple of months for defending NASCAR Sprint Cup Series champion Tony Stewart. In his last eight starts, Stewart has managed just one win (at Daytona in early July), two Top-5 and three Top-10 finishes. An average finish of 17.25 over that span has dropped him from a high of fifth in points to his current 10th-place ranking, just 16 points ahead of a suddenly surging Kasey Kahne. Based on last year’s results, Smoke has the competition right where he wants them. Last year at this time, Stewart was also failing to impress. Over the same eight-race span, he had just three Top-10 finishes, none of them better than second. His average finish was 13.25, and he ranked no higher than ninth over that eight-race period. 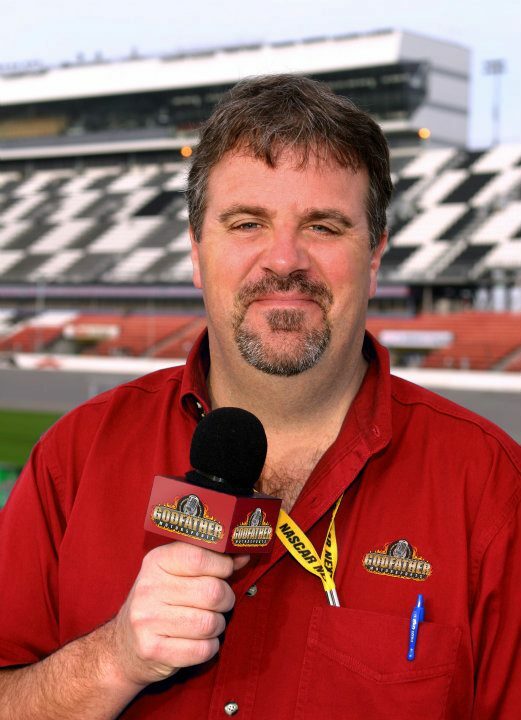 He snuck into the 2011 Chase for the NASCAR Sprint Cup through the back door, telling all who cared to listen that he had no business being there and was just taking up space. "Our stuff is so bad right now," said Stewart almost a year ago today. "We're wasting one of those Top-12 spots." 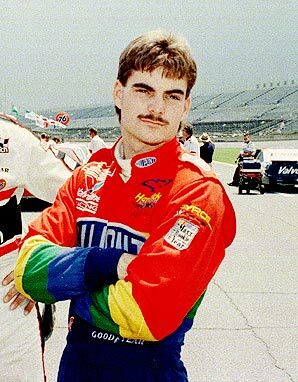 He then embarked on one of the most amazing hot streaks in the history of the sport, winning five of the final 10 races – including a 118-cars-passed masterpiece in the season finale at Homestead Miami Speedway -- and capturing the Sprint Cup championship over rival Carl Edwards in a tiebreaker. If lowered expectations line the road to success in NASCAR, Stewart may once again be ready to contend for the title. After all, he crashed out of Saturday night’s IRWIN Tools Night Race at Bristol Motor Speedway while leading, battling door-to-door with Matt Kenseth with the kind of damn-the-torpedoes ferocity that marked his 2011 Chase performance. If Smoke flames out of the 2012 title chase, it won’t be for a lack of trying. ﻿﻿﻿﻿Fans have come to expect speed and danger on the track at Charlotte Motor Speedway, but on Oct. 13 they’ll be looking up – way up – at an aerial exhibition during the Bank of America pre-race show presented by Nickelodeon’s Teenage Mutant Ninja Turtles. World-famous tightrope walker Nik Wallenda, who made headlines earlier this year when he traversed a 1,500-foot span across Niagara Falls on live television, will bring his high-wire thrill show to Charlotte Motor Speedway. In 1977, CMS became one of the first tracks to host elaborate pre-race shows, and through the years, fans have witnessed a reenactment of the Battle of Grenada; a three-ring circus; numerous world-record automobile stunts; a 5,000-member marching band; and an assemblage of 5,000 firefighters honoring the heroes of Sept. 11, 2001. 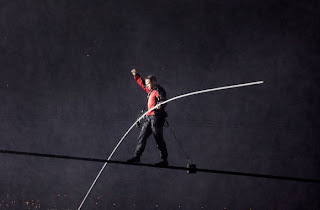 Wallenda, a six-time Guinness World Record holder for various acrobatic achievements, will walk a 5/8-inch wide wire from high above the frontstretch grandstands, more than 750 feet to a crane set up behind Victory Circle. At times, the wire will be more than 100 feet – 10 stories – above the ground, and his total walk will equal the length of two-and-a-half football fields. This year’s performance marks the 26th anniversary of The Flying Wallendas’ high-wire act at Charlotte Motor Speedway in 1986, Nik’s predecessors walked from the grandstands to pit road as part of a circus-themed prerace show. “I’m honored to continue the great Wallenda family tradition performing at Charlotte Motor Speedway,” said Wallenda. “The speedway has always set the bar for pre-race entertainment and excitement, and I’m looking forward to raising that bar to new heights this year. With the Bank of America Weekend Pass, fans can obtain a reserved frontstretch seat to the Bank of America 500 (Oct. 13), the Dollar General 300 (Oct. 12) and Bojangles' Pole Night & UNOH Southern Slam 150 (Oct. 11), beginning at just $99. Fans can also add a choice of a scanner rental, NASCAR Hall of Fame Ticket or Race Shop Tour upgrade for just $25. To purchase tickets, call the Charlotte Motor Speedway ticket office at 1-800-455-FANS (3267) or visit www.charlottemotorspeedway.com. Carl Edwards didn’t even wait for hte question to be asked today, before launching a pre-emptive strike to quell internet reports of his impending departure to Penske Racing to drive the No. 22 Sprint Cup Series Ford next season. Edwards told reporters in a media teleconference today that he has a standing contract with Roush Fenway Racing, and intends to honor it. "No one has asked me specifically about it, but there's a lot of talk about me driving the 22 car next year," said Edwards. "I want everybody… in the media to know that's impossible. "I haven't discussed that ever, with anyone at Penske,” he insisted. “I'm contracted to drive the 99 car. I'm very excited about next season (with RFR), and that's what's happening, in case anybody wants to know.” Edwards said the unfounded speculation has “gotten bad enough that sponsors and folks are asking me about it. I have to try to address that now and make sure you know I'll be driving the 99 car next year for sure. Edwards also scoffed at reports that Shell/Pennzoil will jump from Penske Racing to Roush Fenway next season to sponsor his No. 99 Ford, adding that he never considered the speculation worthy of comment until today. “I thought that was so silly that it had (no) traction,” he said. “But I guess it had." Last year, three-time and reigning NASCAR Sprint Cup Series Champion Tony Stewart swapped cars with Formula 1 World Champion Driver Lewis Hamilton for a day. This year, Mobil 1 gave fans the opportunity to choose Tony’s ride. After three rounds of voting on the Mobil 1 Facebook page, Tony Stewart debuted the Mobil 1 Formula Drift Chevy Camaro SS as the “Choose Tony’s Ride with Mobil 1” fan-favorite on Tuesday at Charlotte Motor Speedway. 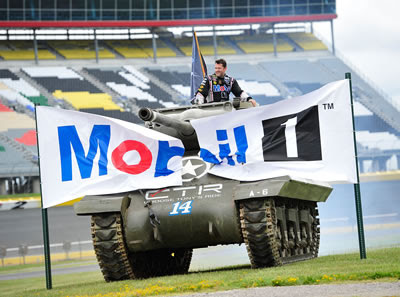 While the Formula Drift Camaro claimed 65% of the online Fan Vote, Stewart bent the rules a bit, seizing the opportunity to wheel a World War II-era M36 GMC Jackson Tank on the infield road course. 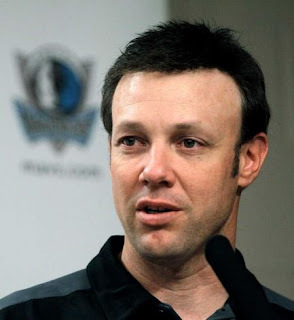 In a move GodfatherMotorsports.com readers first learned of back on June 26, the worst-kept secret in NASCAR will finally be revealed next Tuesday, when Joe Gibbs Racing introduces former Sprint Cup Series champion Matt Kenseth as the new driver of its No. 20 Home Depot Toyota, beginning in 2013. Team president J.D. Gibbs said last weekend at Bristol Motor Speedway that there is still a chance they will retain driver Joey Logano for 2013, as well, if sponsorship can be found to field a fourth Sprint Cup Series entry. Logano will reportedly not be a part of Tuesday's announcement in Atlanta, which serves as the corporate headquarters of sponsor Home Depot. JGR had hoped to secure part-time schedules in both the Sprint Cup and Nationwide Series’ for Logano next season; a proposal Gibbs said the driver “was OK with that until another opportunity came up." Logano is also a leading candidate to drive the No. 22 Shell Pennzoil Ford for Penske Racing next season. Read the June 26 GodfatherMotorsports.com article HERE. Dale Earnhardt, Jr., was treated and released from the Infield Care Center at Kansas Speedway this morning, after a hard crash during the second day of a scheduled Goodyear tire test at the speedway. Earnhardt’s Hendrick Motorsports Chevrolet reportedly suffered a right-front tire failure and made heavy contact with the outside wall. The car was severely damaged, but Earnhardt walked from the Infield Care Center under his own power. He is one of eight drivers testing on the newly repaved 1.5-mile tri-oval today, as Goodyear researches a new tire compound for use at the speedway. In addition to replacing the track’s aging asphalt, crews reworked its 15-degree banking to new, variable degree banking ranging from 17-20 degrees. Earnhardt said yesterday that the changes were noticeable in the first and second turns, but less so at the other end of the speedway. Track president Pat Warren said driver feedback has been positive so far. Adding, “The general perception of drivers is not positive about repaves. They worry about what the track is going to be like when they come back (and) they worry about what kind of grip they're going to have. The response from the drivers was overwhelmingly positive about the new configuration." NASCAR returns to Kansas on Sunday, Oct. 21 for the sixth event in the 10-race Chase for the NASCAR Sprint Cup. The first-time event will feature championship-deciding races for the NASCAR K&N Pro Series East, UARA-Stars Late Models and Frank Kimmel Street Stock Series, all in one jam-packed afternoon of excitement on the one-mile Rockingham oval. A trio of former Rockingham Speedway winners will lead the NASCAR K&N Pro Series East charge on Nov. 3. Chase Elliott (son of 1988 NASCAR Cup Series champion Bill Elliott), Corey Lajoie (son of two-time NASCAR Busch Series king Randy Lajoie) and Brandon McReynolds (son of Daytona 500 winning crew chief and TV analyst Larry McReynolds) have all tasted victory at “The Rock” in recent seasons, and Elliott and LaJoie are solidly in contention for the 2012 K&N Pro Series title. They will be joined by current point leader Brett Moffitt, runner-up Kyle Larson and series veteran Eddie MacDonald as top threats for the checkered flag. Friday will feature practice and qualifying for all three divisions, followed by a Pit Party/Autograph Session on the track’s front stretch. Grandstand admission is free for Friday’s events. Saturday’s schedule begins with driver introductions for the UARA-Stars Late Model Series at 11:30 a.m., followed by the green flag for their 75-lap main event. The NASCAR K&N Pro Series East will follow with a 100-lap championship race, with the 75-lap finale for the Kimmel Street Stock Series closing the program at approximately 3:30 p.m.
Saturday adult-admission tickets are just $20 in advance, or $30 at the gate on race day. Kids age 12 and under are half-price. Reserve your seats now by calling the Rockingham Speedway ticket office at (910) 205-8800, or online at www.rockinghamspeedway.com. Every ticket is also good for a special, $3 admission to the RCR Racing Museum in Welcome, NC. 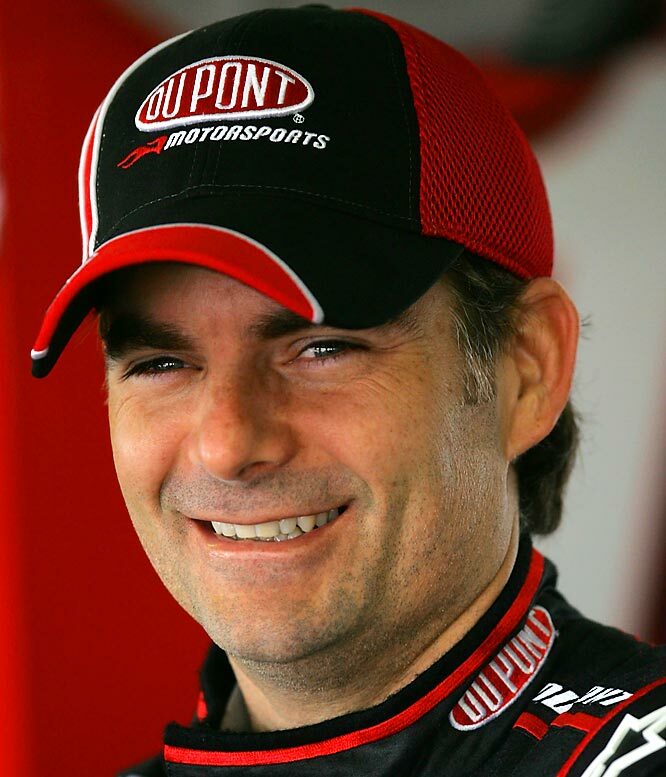 It’s hard to believe it’s been almost 20 years since Jeff Gordon made his NASCAR Cup Series debut. On November 15, 1992, Gordon took the green flag at Atlanta Motor Speedway, driving the No. 24 DuPont Automotive Finishes Chevrolet for Hendrick Motorsports. Today, four championships, 86 victories and nearly 20 years later, Gordon returns to the site of his first start; a race that also featured the final career outing for "King" Richard Petty and a tight championship battle won by owner/driver Alan Kulwicki. "I don't remember too much about the weekend,” admits Gordon of that day, which culminated in a 21st 31st place finish after being involved in an accident. “But I do remember Richard walking through the garage with a huge number of fans with him. He gave us money clips with our starting position during the driver's meeting; something I still have to this day. "Other than that, (it was) not that memorable of a race for me." One Atlanta race that Gordon will not forget was last year's event, which ran on Tuesday evening after being delayed by rain. Gordon out-dueled Hendrick Motorsports teammate Jimmie Johnson in the late laps to capture his 85th career victory and move into sole possession of third place on NASCAR's all-time career win list. "I expect the track to be a lot faster at night (this weekend)," said Gordon, who has five wins, two poles, 15 Top-5 and 24 Top-10 finishes in 38 starts at the Georgia speedplant. "But I think we will still be able to race high, low and everywhere in between. "I think one of the reasons so many drivers and teams love this place is the track has a lot of grip, a lot of banking and is a very fast race track - especially when looking at the qualifying speeds. It's very fast during the race, but it has a lot of fall off. Tire wear is significant and the balance of the car changes throughout a run." While there have been many changes over the last 20 years -- competitors, manufacturers, car models, tracks, etc. 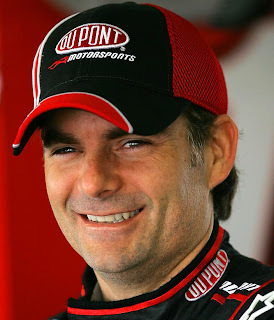 -- one constant has been the combination of Gordon, Hendrick Motorsports and DuPont. "They took a chance on me, there is no doubt about that," said Gordon. "But it turned into a great partnership. "One that is approaching 20 years." 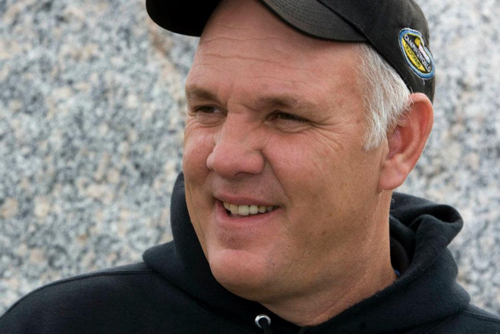 The National Motorsports Press Association has selected Rockingham Speedway President Andy Hillenburg as the second quarter winner of its NMPA Speedway Motorsports Spirit Award. The award is designed to recognize character and achievement in the face of adversity, sportsmanship and contributions to motorsports. Quarterly winners are selected each year, with an overall winner determined by a vote of the National Motorsports Press Association membership. Hillenburg was selected for his efforts to return Rockingham Speedway to prominence. He bought the track at auction in October 2007 and in April of this year hosted NASCAR’s return to the legendary North Carolina track for the first time since 2004. Also receiving votes were: Jimmie Johnson, Ricky Benton Racing, Ellen Siska and Tony Stewart. With two races remaining the regular season, four drivers have punched their tickets to the 2012 Chase for the NASCAR Sprint Cup. Point leader Greg Biffle, five-time series champion Jimmie Johnson and perennial Most Popular Driver Dale Earnhardt, Jr. all received the black-and-yellow hats indicative of clinching a spot in the Chase Saturday night at Bristol Motor Speedway. A fourth driver, former champion Matt Kenseth, locked-up at least a Wild Card berth, and can officially clinch his spot this weekend at Atlanta Motor Speedway. If the 2012 title were contested only among those four drivers, it’d be one heck of a battle. It won’t, of course, leaving eight additional positions to be filled by the time the Sprint Cup Series rolls out of Richmond International Raceway two weeks from Saturday. Five drivers have at least a mathematical chance to claim a non-Wildcard spotin the Chase this weekend at Atlanta Martin Truex, Jr., Clint Bowyer, Brad Keselowski, Denny Hamlin and Kevin Harvick. It is unlikely that all will do so, however, meaning that we’ll likely go to Richmond with at least a handful of Chase spots still undecided. A win at Atlanta will lock up at least a Wild Card spot for Hamlin, Harvick and Stewart. Depending on the Sunday’s final results, Bowyer, Keselowski, Hamlin, Stewart, Kasey Kahne and Kyle Busch could all clinch at least a Wild Card spot. For what it’s worth, here are the clinch scenarios for the four drivers whose destinies are entirely in their own hands this weekend. With any luck, we’ll spend most of next Saturday night at RIR with calculators in hand, trying to discern who’s in -- and who’s out -- of the Chase, based on a position lost (or gained) on the race track. Speedway Motorsports CEO Bruton Smith was dead wrong in his attempt to narrow the usable racing groove at Bristol Motor Speedway by grinding down the outside lane. Call it the best mistake of Smith’s life. Since 1961, the track known as “Thunder Valley” has been famous for no-holds-barred, bare-knuckled stock car racing; the modern-day equivalent of Christians vs. Lions. Fans loved it, filling the seats to capacity, season after season, and making Bristol the eighth-largest sporting venue in the world. One of the toughest “gets” in professional sports, Bristol’s 160,000 tickets became the subject of divorce decrees and wills. At least, that is, until 2007, when Smith decided a face lift was in order. The bombastic owner/promoter hired a platoon of engineers to turn the venerable, 36-degree oval into a new, concrete bullring, complete with modern, variable-degree banking. While the rebuild was an artistic success, producing long stretches of side-by-side racing for the first time in the track’s history, fan reaction was mixed, at best. Raised on a steady diet of volatility, carnage and mayhem, longtime patrons rebelled against the new, more genteel Bristol. It was like buying tickets to the Roller Derby, then sitting through a performance of the Bolshoi Ballet. Ticket sales plummeted, forcing Smith to announce that he would rework Thunder Valley once again, grinding down the track’s uppermost groove in an effort to force a return to the good old days when, in order to pass a man, you first had to move him. It didn’t work, at least not entirely. Drivers began Saturday night’s IRWIN Tools Night Race as expected, racing solely in the track’s bottom two grooves. But as the event progressed, they gradually expanded the racing lane upward. By the time the race reached its halfway point, Smith’s off-limits high lane had inexplicably become the fast way around, creating an unintended amalgam of both the old Bristol, and the new. Drivers could still pass, as evidenced by a robust 22 lead changes among 13 different drivers. It wasn’t easy, however, and 13 caution periods slowed Saturday’s race; the most for a Bristol 500-miler since the rebuild. Tempers flared – just like in the old days – with former series champions Tony Stewart and Matt Kenseth wiping each other out while racing for the lead on lap 333. Stewart climbed from his steaming, wrecked racer and hurled his helmet at Kenseth’s passing car, striking it flush between the headlights with a high, hard one that brought the faithful to their feet with the kind of lusty roar that had not been heard at Thunder Valley since 2007. 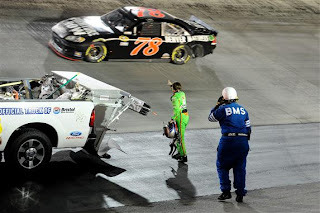 Stewart resurrected the long-dormant Bristol vow of revenge shortly after, pledging to “run over (Kenseth) every chance I get for the rest of the year.” Later, Danica Patrick’s crew chief, Greg Zipadelli, threatened to strangle driver Regan Smith, after contact with his No. 78 Chevrolet sent Patrick into the wall and ended her night just 66 laps from the finish. It was everything we loved best about Bristol. And more. For the first time in memory, pit strategy played a role at BMS, keeping the race’s final outcome in doubt until the late going. Not until Denny Hamlin surged past a fading Carl Edwards to take the lead with 39 laps remaining did the verdict become clear, and after claiming his third checkered flag of the season, Hamlin gave Bristol Motor Speedway’s newest incarnation high marks. “It’s a different kind of racing,” said Hamlin, confirming that the bottom of the track was “not the fastest way around. It was the same (as the old days),” he said. “We were all running in line, waiting on the next guy to screw up to get around. That’s what you had to do at the old Bristol and that’s exactly what we had to do today. Things may not have worked out quite the way Smith had envisioned Saturday night, but the end result is beyond dispute. Fans enjoyed great racing, with enough mayhem to satisfy those for whom the Bolshoi Ballet will never do. All hail the newest Bristol Motor Speedway. Trevor Bayne has been around awhile. 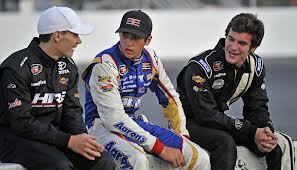 Since 2009, the Knoxville, Tenn., native has amassed 111 starts in the NASCAR Nationwide and Sprint Cup Series. Only once in that span has Bayne run a complete season, however, taking part in all 35 Nationwide races in 2010 en route to seventh place in the final season point standings. Even then, he was forced to compete for two different teams, joining Roush Fenway Racing after a late-season split with Michael Waltrip. Throughout his big-time NASCAR career, spotty sponsorship, health issues and other factors have limited Bayne’s ability to compete. Even an upset win in the 2011 Daytona 500 failed to earn him a full-time ride in the upper levels of NASCAR, a sobering fact that will be remedied next season. With teammate Ricky Stenhouse, Jr. slated to replace the departing Matt Kenseth in the No. 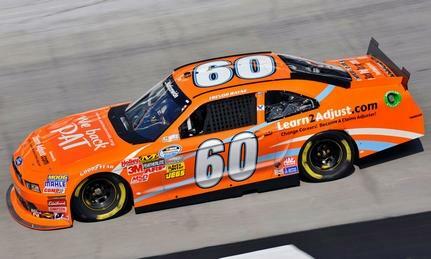 17 Ford next year, Roush Fenway Racing confirmed this week that Bayne will run for the 2013 Nationwide title in the No. 60 Mustang currently wheeled by Stenhouse. While sponsorship is still being sought, Bayne said the team has assured him of that full-time ride, in addition to another limited schedule of events in the Wood Brothers Racing Sprint Cup Series Ford. To that end, he admitted badgering Roush for more Nationwide starts this season. "This could be our last Nationwide race of the season,” said Bayne. “I've been trying to talk Jack into more (races), since he's wanting to run full-time next year, for the championship with me in the car. I'd like to get my feet wet and get some momentum going. I think that would be a good thing to do, just to get a feel for the Nationwide cars again." He reinforced that lobbying effort by winning the pole for tonight's Bristol Nationwide race. You can't fault a guy for trying. 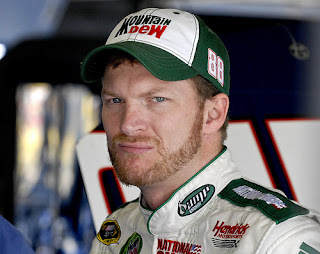 Earnhardt: "I take offense to the claims." Brad Keselowski said this week that Hendrick Motorsports is more willing to play in the gray area of the NASCAR rulebook than his Penske Racing team, taking chances and risking penalties in areas that other teams are unwilling to explore. Dale Earnhardt Jr. rode to his team’s defense today, telling reporters that Keselowski should talk less and drive more. While stopping short of accusing HMS of cheating, Keselowski questioned how Hendrick has “tricked up" the cars of title contenders Earnhardt, Jimmie Johnson, Jeff Gordon and Kasey Kahne. "There are parts and pieces on the cars that are moving after inspection that make the car more competitive,” he said. “Some guys have it, some don't. There's a question to the interpretation of the rule. Penske Racing errs on the safe side, because we don't want to be the guys that get the big penalty. “I like Brad,” he said. “We’re friends, and I don’t really want any drama with him." The all-new 2013 Ford Fusion Titanium, Official Pace Car of Ford Championship Weekend at Homestead-Miami Speedway, will drive off the track and into the driveway of one lucky fan, thanks to a combined effort between Ford and Sprint. Win the 2012 Homestead Pace Car! The 2013 Fusion production car -- being revealed today at Bristol Motor Speedway in advance of Saturday evening’s Irwin Tools Night Race – will hit dealer showrooms later this fall, while the new 2013 NASCAR Fusion takes to the track beginning next year. 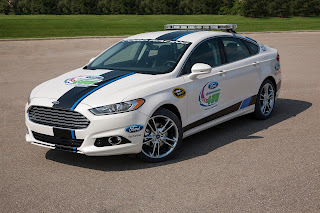 The Fusion pace car that will take the green flag at Homestead was put through a shakedown run earlier this month at Ford’s Dearborn test track by Ford’s NASCAR Sprint Cup drivers, including current point leader Greg Biffle. It features a special paint scheme reminiscent of the Ford EcoBoost paint scheme featured during the reveal of the 2013 NASCAR Fusion, and used by many of Ford’s top race cars around the world during the month of August. The winner also receives an all-expenses paid trip for two to Las Vegas, where they will be presented their 2013 Ford Fusion Titanium at “NASCAR After the Lap.” the fan event that is part of NASCAR Champion’s Week. Godfather Gear Is Near! Give Us Your Opinion! VIDEO: Kelley Eats The Egg! 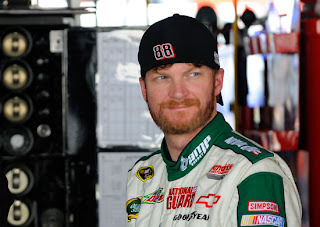 Buy Your Next Car From Dale Earnhardt, Jr.!! Mystery: JGR Building Fuzzy Cars! Limited Nationwide Schedule For Patrick In 2013?